Now that the evenings are getting darker, you’re not going out as often. Now you need to find things to do at home. I spend most of my evenings reading, watching TV or one of my many unfinished craft projects. I would love to spend more of my time reading, however, I struggle to find somewhere quiet where I can hide. Being able to immerse yourself in a good book helps you relax. You may be surprised to know you do not need a huge amount of space to create your own reading space. Do you have some spare unloved space? An underused storage cupboard perhaps or is the space under your stairs currently unused? We’ve got a few ideas for you inject some love and use into these unloved spaces in your home. A window seat (we found this one from Beautiful Home Ideas) is a great way of injecting some love into unused space by a window. This is especially ideal if you have bay windows as they allow for lots of natural light and a large seating area. Why not build in some shelving to surround the window to store all you books? Alternatively, borrow the idea for draws under the seat (or a fold up seat) if you prefer a more minimalist look. Accessorise your window seat to give it some personal style. This will really help you to chill out and relax. This can be easily done with some lighting and soft furnishings. 1 = Fisherman 8686CP Firstlight £54. This copper finish in combination with the vintage fisherman style is so timeless. Ideal for a wow piece for your window seat. 2 = Amalfi AMA0750 by Dar Lighting £104.50 (if brought with shade shown). This light gives you the benefit of being independently switched. So you have the option of a gentle low light and a flexible LED light. Gives you the light exactly were you need it most. 3 = Never Grow Up Peter Pan cushion by AlixInsanity. I fell in love with this cushion as soon as I saw it. This was definitely one of my Top 10 childhood films and this cushions really encompasses the best bits. Available in various sizes. This is proof that you don’t need much space for a private hideaway reading nook. A space this size could be being currently underused as a storage cupboard, the space under the stairs or in your attic. Don’t have room for shelves, why not use the space under the day bed? If you do have room then what do you think of this tree style book shelf design? It adds some great style if you’re after something a little different. Make this space your own. 1 = Joshua JOS0763 by David Hunt Lighting. If you’re going to follow through with the concept of the panelled wood then this will match in perfectly. 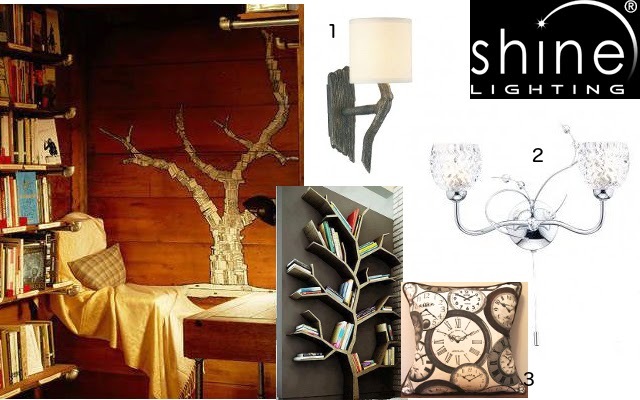 This bronze wood effect wall light looks so decorative and will give a great light for reading by. 2 = Annabelle ANN0950 by Dar Lighting. This beautiful 2 light wall light is switched, so it is super convenient in addition to looking stunning. The glass shades means this will give you a great light level for reading. I love the glass beads of the wire, it means this looks beautiful on or off. 3 = Clock Vintage Cushion from OhSewContemporary. I love vintage clocks. This looks stunning, it would look fantastic mixed in with a couple of more colourful designs. 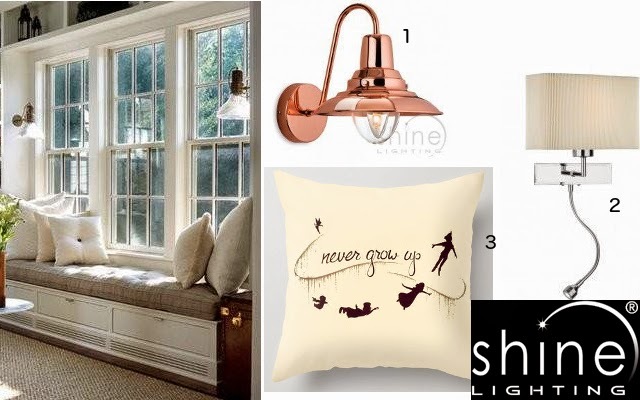 We hope these ideas have left you feeling inspired about the potential to create your own reading corner. It will be the ideal place to hide away for the winter.